Karen people gathered in the US, UK, Norway, Sweden, Asia, Canada and Ireland and in jungle bases back in their homeland on 12th August, to commemorate their 61st Martyr’s Day. Saw Ehna reports from Karen State. In a jungle base in Southern Burma, 400 supporters from the Karen National Union’s Mergui-Tavoy District office commemorated the 61st Karen Martyrs’ Day with a military salute for their fallen leaders and comrades. Saw Kwe Htoo Win, the KNU, Mergui-Tavoy District chairman addressed the people. 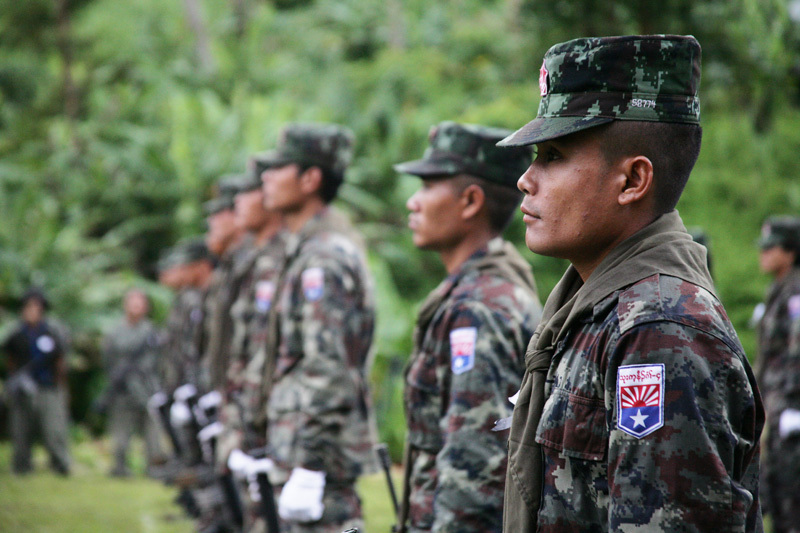 The KNU has been fighting against the Burmese military regime for 62 years, the world’s longest running civil war. The initial aim of the KNU was independence, but since 1976 it has called for a federal union. Karen Martyrs’ Day marked the death of its first leader, Saw Ba Oo Gyi, who was killed by the Burma Army in 1950. Since its inception Martyrs Day has also remembered all the other Karen men and women who gave their lives for the Karen cause. The KNU’s Saw Kwe Htoo Win said even though Karen people were tired of fighting for so many years it was important to keep striving. A recent development was a call from pro-democracy leader Aung San Suu Kyi to broker peace talks between Burma’s ethnic groups and the government. The KNU, along with the other major ethic groups welcomed and supported Suu Kyi call for Burma’s newly elected President Thein Sein, and the leaders of the ethnic armed groups – Kachin Independence Organization, the New Mon State Party, the Shan State Army the KNU – to hold peace talks to end the conflict in Burma. Since November 2010 when Burma held its first national elections in 20-years, conflict between the major ethnic ceasefire groups and the Burma Army has broken out in Karen Shan and Kachin States. The Karen struggle has been boosted by an alliance with the Democratic Karen Buddhist Army fighters, who until recently were closely aligned with the Burma Army. The DKBA split after the Burma Army attempted to disarm and dismantle ethnic ceasefire groups. The Burma Army’s intention was to reduce their size and reform the groups as a Border Guard Force and bring them under the strict control and command of the Burma Army. Col. Saw Ler Pwe, who refused to accept the conditions set by the Border Guard Force, led the breakaway DKBA faction. He was later joined by 1,000 troops led by Major Saw Beeh and at the time of writing the Karen soldiers are fighting together against the Burma Army. Saw Kwe Htoo Win says the KNU and its members need to analyses the current political situation in Burma, need to update their tactics and adapt political positions to meet the changes. He says it is not easy as the KNU has members with different points of view. Saw Kwe Htoo Win, is regarded by many Karen as a pragmatic and a reformist leader and he is the newly elected chairman of the Ethnic Nationalities Council (ENC). Saw Kwe Htoo Win said it is important ethnic people worked together.